For beautiful looks, elegance and style, for top quality products, customer care and great value, Just Shutters provides the finest choice and widest range of Window shutters Derby, call us today on 0115 838 2558. 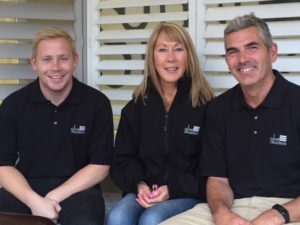 Just Shutters Nottinghamshire was set up by husband and wife team Jill and Andrew Spivey, with son Joe. As a local family business, we care about our customers. Are you looking for a window (or door) covering that gives you more than curtains and blinds? Do you have an eye for designer elegance? Are you looking for a solution that provides style AND value? – You are looking for beautiful interior shutters and you have come to the right place. Shutters are sleek, contemporary and elegant. They have no dangling cords, no dusty, allergen filled fabrics encumbering your window or door. Shutters let in light while providing privacy and can be used even in warm and damp environments such as the kitchen or bathroom. Shutters are so easy to maintain, just wipe clean! They are so hardwearing and long lasting. So confident are we, our shutters are backed by our lifetime guarantee! Whatever you choose at your windows and doors has a huge impact upon the room, it can change the decor, mood and lighting. With the widest range of styles and the experience to know which solutions work the very best, we have the know-how and products to ensure the perfect shutters are designed and fitted for your home. Unique and individual, each set of shutters is designed and made for each customer, so whatever your look and style, whatever your room and decor tastes, we can create shutters that match or make a stand out impact. From standard squares to perfect portholes, from bays and Velux to a 50ft atrium, we have made over 7000 homes and businesses delight in our stunning plantation shutters, please be inspired by viewing our extensive shutter galleries. Shutters provide you with privacy and light without the need for dated net curtains, you can enjoy the ambient light filtering through the slightly reflective louvres, creating the perfect environment within, or throw open the shutters for windows unencumbered by fabrics, or close completely for an almost blackout effect – perfect for cosy nights and deep sleep! Luxury doesn’t have to cost as much as you may think. While curtains can fade and tire, while wooden blinds can bleach and warp, shutters last and last. As an addition to your home, shutters can add value for years to come. Couple this with the energy efficiency provided by shutters and having no need to launder, shutters offer long term value that is hard to beat. 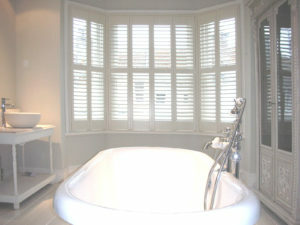 We at Just Shutters furthers the value of our shutters by adding in a lifetime guarantee, that is how confident we are. Please contact Joe by calling 0115 838 2558. Shutter installed to two bathroom. Shutters fitted to two bays and an office window. Plantation window shutters Derby, shutters fitted throughout the house. You may also like to see: Plantation Shutters Chesterfield, window shutters Nottingham, shutters Loughborough, shutters Newark-on-Trent.